I recently finished listening to the Thrawn Trilogy audio book on Audible. If you are a Star Wars fan and are looking for some source material for all the cool new Star Wars games then I highly recommend this read (or listen as it were). Before listening to the Trilogy, I didn't know much about what happened after episode six, so this was a nice tie-in to the movies for me. I am hoping to use some of the background story and event in the Star Wars RPG by FFG. If you haven't read or listened to it, check it out. It is pretty good! An awesome series, and a lot of fodder for EoTE games. 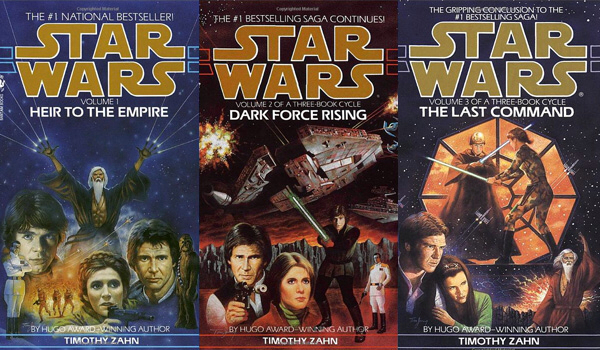 It's interesting to note that Timothy Zahn was the first author allowed to write further beyond Return of the Jedi.